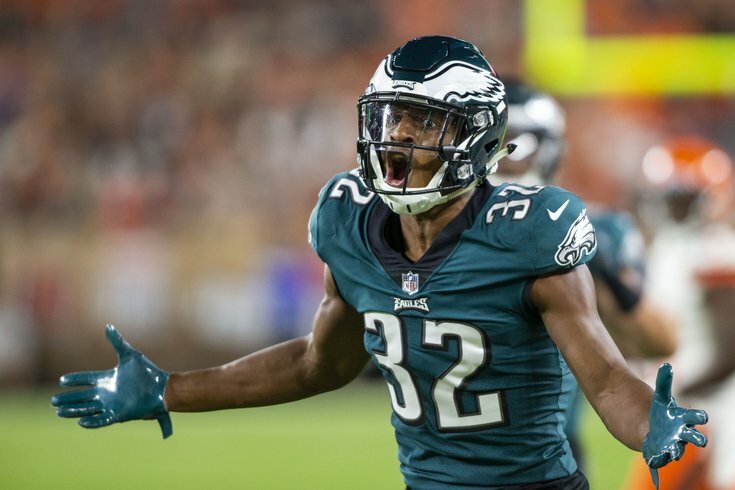 Philadelphia Eagles cornerback Rasul Douglas. The Eagles suffered their worst loss of the year in a decade possibly of this millennium on Sunday when they were embarrassed by the Saints, 48-7, in New Orleans. The defeat sent the Eagles to 4-6 on the season, and put them a loss to the Giants on Sunday away from a last-place tie in the NFC East. That's not exactly where Eagles fans expected their team to be two and a half months into the NFL season. Not by a long shot. "I think the message to the fans, just like I told the team after the game, first of all, you can't hang your heads. And if anybody does, and anybody begins to doubt, quite frankly, you don't need them because we believe and I believe in those players, I believe in those coaches. "And it's a group that is hurting, quite frankly. And it's a group that will pick themselves up this week. They're not going to feel sorry for themselves, and we're going to get ready for the Giants." And when the coach says his team is hurting, he doesn't just mean mentally. "I mean, look at our injury list," he admitted. "Both, physically and emotionally." In Sunday's loss to the Saints, both were obvious. "It’s a big list," Pederson said of his injured players. "A big, big, big list." That already long list grew even longer in Week 11, but according to the updates given by Pederson at his weekly day-after press conference, the Birds might not be hurting as badly as expected following a game that saw a secondary filled with players you've probably never heard of before they entered the game. Long snapper Rick Lovato was running to the Saints sideline as if it were the #Eagles. A Saints player had to turn him around. • Linebacker Jordan Hicks (calf) is week-to-week. • Cornerback Sidney Jones (hamstring) is week-to-week. Pederson also said that his injury is new and not related to his previous hamstring injury. • Center Jason Kelce (elbow) is "fine," according to Pederson. • Defensive backs Avonte Maddox (knee) and Rasul Douglas (knee) are both day-to-day. According to Ian Rapoport, Douglas suffered a sprain.